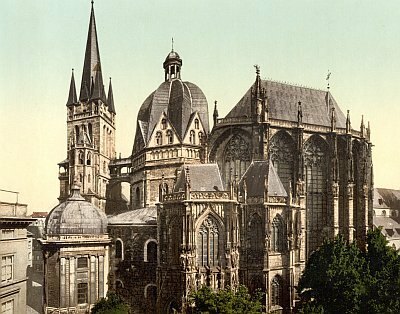 The Aachen Cathedral was built by Emperor Charlemagne of the Holy Roman Empire. This Palatine chapel dates from about 800 AD . Charlemagne died in 814, and was buried in his own Cathedral. His bones are still preserved in the Shrine of Charles. During the 14th and 15th centuries new features as the choir were added to the church, in the fashionable Gothic style. More additions followed in the following centuries, the 74 meters high tower as recent as 1884.